Things for the restaurant are flying by at a meteoric pace right now and it seems hard to slow down enough to do anything but work and cook for sustenance; yet Christmas was such an incredible respite from hectic life. Life moves at a slower pace in the South and I will forever love that and be linked to the concept of whole animal eating due to my grand and great grandparents heritage and my mother's gracious gift of the seminal texts by Fergus Henderson "The Whole Beast" and "Beyond Nose to Tail." I grew up with fried hog jowl and black eyed peas every New Year's Eve and have now graduated to Fergus' fried pigs tails and warm pig head salad. There is something disconcerting to the American psyche to see an animal's head sitting on a plate. I was a bit offput at times trying to cook it but it was truly an opportunity for growth and liberation. The idea that one of the most delicious salads I have ever made was born out of a necessity meat- a cut that our ancestors took great pleasure in turning into headcheese. To think something beautiful can come from a cut that terrifies so many that would ultimately agree that the end result is a success. The peppery arugula paired with the richness of the pork and the tang of the mustard vinaigrette harmonize as much as Henderson meant it to. We must throw caution to the wind and try to cook foods out of our comfort zone. You will find yourself with combinations beyond your wildest dreams when off bits are added to your repertoire. Unlike my usual form of posting a recipe I am going to leave you with a final thought. Find one of Fergus Henderson's books and use it to change the way you look at waste and the way you approach cooking. May every bone have a chance for a stock and every head have a chance for a salad. It's funny to me to take note of how people talk and share stories about food and meals, recipes in particular. Typically if I receive a recommendation for a recipe, it's because there is some family history to it, or its been copied on to a scant, wrinkled sheet of paper with little to no attachment to its original source. I'm not saying this is a bad thing. Food should be inspired and original. Nine times out of ten, I would say that citing off chef, cook book, and page number is less likely to make motivate me to try a recipe than hearing someone describe at as similair to a dish their grandmother made, or a recipe they could do something unique and interesting too. For Christmas this year, Daniel and I received a plethora of cookbooks, including Nancy Silverton's Breads, Michael Ruhlman's Ratio, and Fergus Henderson's Nose to Tail Eating and Beyond Nose to Tail.With books like Breads and Ratio, it's easy to adapt recipe and personalize them to your own tastes. A cookie is a cookie by any other name, and a baguette is a baguette. These are framiliar, comfortable. This may not be as true with Fergus Henderson (more on that later), but there are still elements of framiliarity and comfort that give you courage to try something new, go out of order, add or subtract components, and basically make something your own. Every once in awhile though, a recipe just catches your eye that I think you have to go at verbatim, teaspoon by teaspoon, step by step. It's these recipes that remind me of the 'paint by number' paintings I remember doing growing up. I'm much more comfortable with a pen and paper to write, than I am with a paintbrush and pallete to fill. Similairly, I'm much more comfortable whipping up a delightful dessert or warming soup than I am creating a silky veloute to combine with some odd meat puree. But, it's in these moments of unfamiliarity that you can be comforted (I think anyway) by the culinary delights created by others, and reawaken your culinary curiosity. 1. Reduce vinegar by half in small saucepan over medium heat.Set aside. 2. In a small saucepan, melt butter over medium heat. Whisk in flour and continue whisking for one minute. Slowly whisk in stock and cook until thickend to make veloute. Set aside to cool. 3. In meat grinder or food processor, process mortadella until pureed. Transfer to bowl and fold in whipped cream and veloute sauce. 4. Rub bread with olive oil and toast. 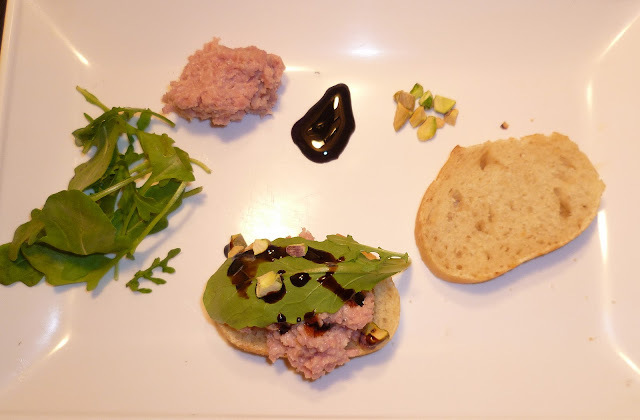 To Serve: Smear the bread wit the mortadella, garnish with arugula, pistachios, and a drizzle of balsamic. Serve warm. Enjoy! Published by Saveur, and originally taken from Chicago's Purple Pig restaurant, this produce a delightful and "devastatingly addictive" treat. A simple creamy, meaty, satisfying mortadella spread atop a toasty baguette, topped with a little bit of peppery arugula, nutty pistachios, and a splash of reduced balsamic for the tiniest hint of sweetness. Truthfully, this new recipe is nothing earth-shattering. If you've never tried mortadella, its basically an Italian bologna that looks, smells, and tastes, pretty much like bologna if you sample the variety without pistachios. Even if you're thrown off by the bologna comparison, it truly is an intriguing delight.When selecting the next post to blog about, someone may have scoffed at my desire to share this verbatim rendition of a recipe, but it struck me as something new, and something I may not have tried if someone hadn't drawn the lines and numbered the color palette or taste palate for me. I have been reintroduced to the joys of fried turkey in recent months. What a holiday delight to pull such an utterly delicious and gleaming bird out of the depths of peanut oil. That moment of realization that it is juicier than any roasted turkey you have ever laid your lips on is truly a cherished one. Turkey expedition number one began in the back yard of a friend of mine's apartment. He had injected an eighteen pound turkey the night before with worcestershire sauce and cajun seasoning. We rubbed the outside with cajun seasoning to add an extra element and lit the gas to get the party started. After lowering the large bird into the grease and checking it about an hour later the outside was an astounding shade of sienna that immediately shouted "eat me." The result was very similar to the second turkey I cooked for Christmas dinner although I sincerely wish I would have photographed the first one Nate cooked. The grandness of the larger bird is certainly an undertaking well worth your time. And all those around you will thank you for your efforts. The Christmas bird had to share room with a ham so we opted for a twelve pound bird so as not to overwhelm my mother-in-laws already full fridge. The holiday goodies were flowing from the homemade fudge, buckeyes, and chocolate covered cherries, to homemade egg nog and bacon cinnamon rolls. I can not promise when or if we will post some of those recipes. The bacon pecan cinnamon rolls were certainly a hit even with Dawn's grandparents despite their initial hesitant glances. But after all the holiday celebrations and preparations on Christmas morning I set out to cook a bird that was dressed to impress. By that I mean I tried to spice up the preconceived sage nuances that I was told every turkey should have (sorry that I disagree). I mixed up a nice bowl of spices to blanket the bird from head to toe. But, after the meal the synopsis was unanimous that whether you call it unsophisticated or countrified or delicious for that matter- everyone agreed it was one of the best turkeys they had ever eaten. The night before you are going to cook the turkey mix the seasonings together thoroughly and rub into the outside and underneath the skin of the turkey on the breasts. Refrigerate overnight and pull out of the fridge an hour and a half before you are going to cook it. 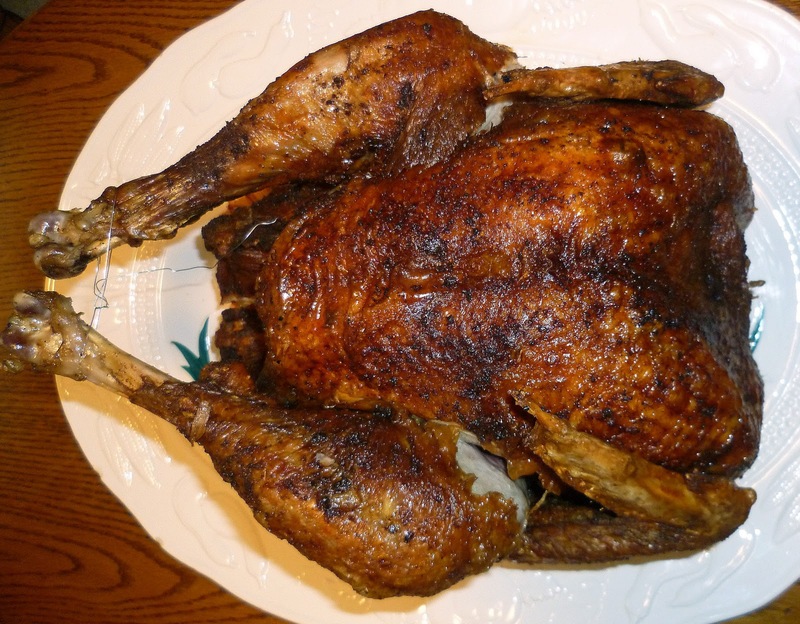 Heat your turkey fryer up to 355 to 360 degrees, because your oil will cool down a bit with the turkey in it. Lower your thoroughly dried turkey (preferably on a tube to keep it centered) into the oil and cook at 350 degrees for approximately three and a half minutes per pound or forty minutes for an twelve pound turkey. Check with a thermometer in the breast to assure the meat is 170 degrees. Pull out of the oil carefully and allow to cool for at least fifteen minutes. Enjoy with a nice glass of cava.